I’ve always been an artist of one kind or another, and I started sculpting by making the cake topper for my wedding. I went on to do custom cake toppers as a career for about 3-4 years before eventually transitioning into super hero, monster, fantasy and sci-fi statues, which is what I grew up on. I don’t know that I have a favorite, but I am pretty happy with the way my “Conan: Fury of the Beast” piece came out for Sideshow. 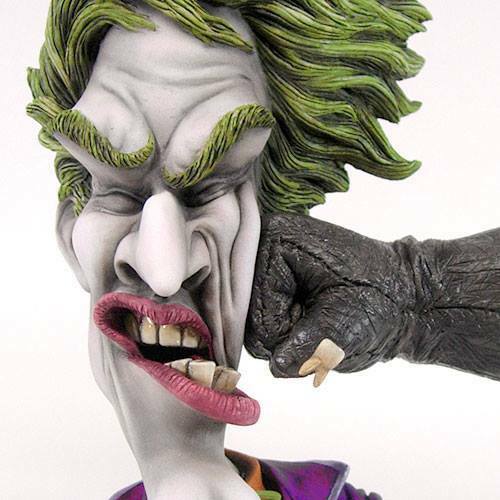 Tim Bruckner’s Joker for the DC Dynamics line. Everything about that piece is just brilliant. Hmmmmmm. I don’t really have a dream piece per-se. Maybe a giant diorama with various scenes from Calvin and Hobbes. Conan. It’s pretty obvious that He-Man and Lion-O don’t know how to use a sword.